You are currently browsing articles tagged resources. Recognize this picture? If you’ve seen our missions display you might. It’s a snapshot of our struggle to teach and train in spite of the lack of resources on the mission field. In that particular instance, I was trying to set up an old projector without a VGA cable on a kiddie table. The result, after an hour of work, was frustration. We went without the Power Point that session. 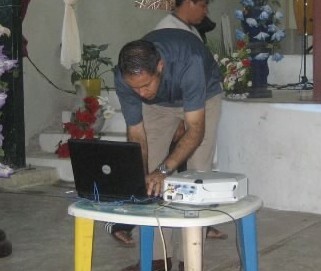 It’s a common tale when we have to rely on what the local church may have on hand to facilitate our presentations. In many locations, even a white board is a luxury! However, thanks to Vector Ministries and their Speed the Light challenge, the frustration that you see in the above picture is a thing of the past. This past Sunday, at Praise Assembly in Springfield, they presented us with a brand new Sanyo projector, complete with cables! Now instead of worrying about our equipment us as we head out to train, we’ll be able to focus on discipling those we’ve been called to serve.